A larger mini soccer football goal that will look good in any garden. A hard working garden football fun goal that can take the hardest shot. A unique anchor system secures the goal post to the grass and no digging is required. Compared to the alternative flimsy Far East goal posts these football goals include a top quality long lasting net. A safe, sturdy value for money goal " Made in Sheffield" that is easy to use competitively priced and guaranteed to last. A plastic football goal that will outperform the rest by a country mile. We guarantee your budding soccer star will love these goals. 300 % THICKER & STRONGER THAN COMPETITORS GOALS and the only plastic football goal with rear net supports that do not detach from goal or crease. 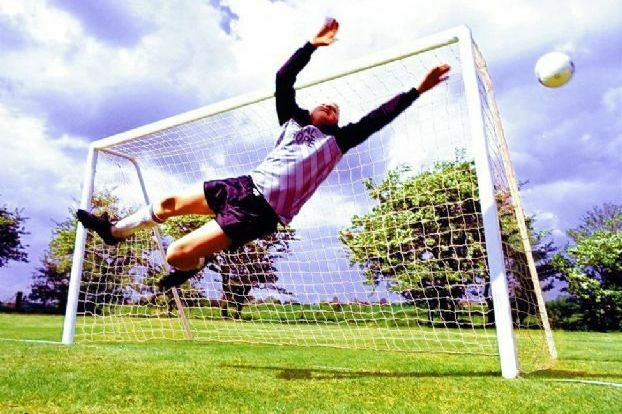 Each football goal is supplied with a top quality longer lasting white goal net. Hi John...We recently purchased a set of goal posts from yourself a couple of weeks ago which I have to say are absolutely fantastic. 12' x 6' MINI SOCCER GOAL Dear Soccertackle, Just to let you know how delighted I have been with the 12' x 6' goal that I purchased from you over two years ago. I bought it for my 16 year old son for him and his friends to take to the park. It has been used regularly since and now the boys are 18 it takes a bit of a hammering. It is with great pleasure that I can say that it is still in the same excellent condition as the day I bought it. Sometimes the ball thumps off the bar or post but the goal has always stood firm. It seems as if it is indestructible. An amazing product and such value for money. I would highly recommend one of these goals for kids and adults. My only regret is that I did not buy one many years ago.